Doing a product review wasn't part of the sponsorship agreement but I just think these are such fabulous value for money that I thought I'd share with everyone! In our house, a reward sticker goes a long way, T's nursery hand them out, the doctors (where he spends half his life!) hand them out and I love handing them out as a reward. Luckily T is still motivated by this method and uses his reward stickers as a 'badge of honour'! So when I need a little extra help to get him to do something we turn to reward stickers. At the moment we have 2 major challenges, 1. Getting T to clean his teeth twice a day and 2. Trying to get rid of his bottle. Let's just get 2 out of the way first, so far, stickers, a batman outfit, an ironman outfit, a ninja turtle outfit, a Spider-Man toy and an ironman toy all won't make him give up his damn bottle before bed without a tremendous fight. It has cut right back to one before bed and none in the day and only in bed but no, he's still clinging on. The idea is that he'll get one of his chosen 'rewards' every 5 days he's bottle free and we'll be using stickers to monitor. So far my money is as safe as houses! Onto teeth cleaning, our usual teeth cleaning routine generally ends up with me getting him in a headlock and giving his nashers a good old scrub! He's even bored of his Spider-Man electric toothbrush, his egg timer and the aqua fresh app, even though I gave him my old iPhone as an iPod touch to download the app to! Anyway, because T eats far too many sugary snacks (a whole other blog post!) he's been told that he'll go on a sweet ban if he doesn't clean his teeth every morning and every evening. I'd also love it if he had to clean them at nursery but so far they are a little reluctant to do this and I completely appreciate why, as a mum it would just help to reinforce the clean teeth after meals thing. So far the reward chart is working! The Hubs promised T a 'surprise' once his chart was complete although I'm not sure their ideas of 'surprise' will match up, personally I like to be specific with a bribe, I mean reward ;) so that T know what he's getting at the end, we'll see what happens on that one when we get to the end! 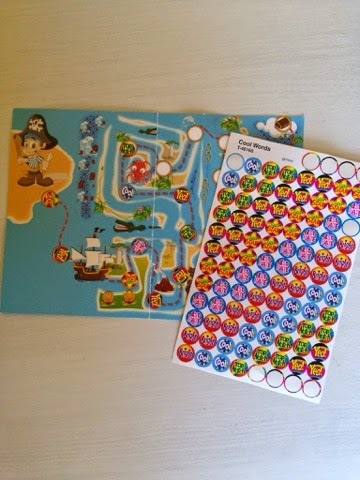 T loves peeling off the stickers and following the pirate map to find the next place to put his sticker, he's also getting really good at placing it right over the circle (oooops my ocd tendencies showing in him!) I'm sure that this helps with his fine motor skills, but I'm certainly no expert in that area. 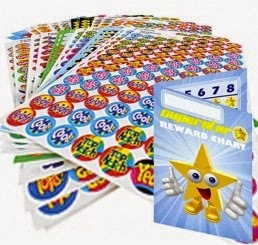 The sticker stocker reward stickers and free pocket reward chart are just 99p each with various sticker themes to choose from and free UK delivery. There are 3 designs of charts and loads of different stickers to choose from. I think these are unbelievable value. One sticker sheet will last for 4 or 5 charts too - amazing! 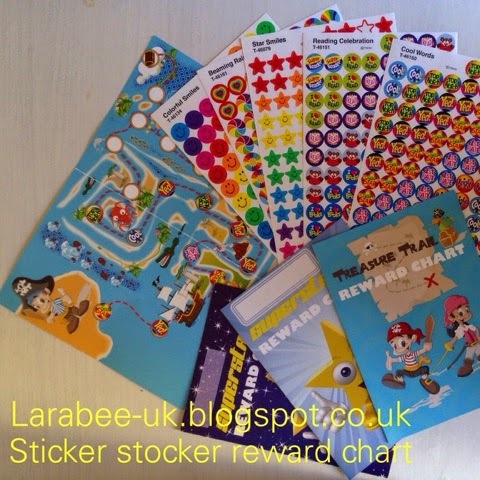 I'm giving a free pocket reward chart and sheet of stickers to each of my Easter #kidsstickerswap swappers as a little thank you and we've got more fab prizes to giveaway from Sticker Stocker. If you are interested in joining the swap, the details are here. Even if you are not interested in the swap, I'd highly recommend you pop on over, as well as stickers, there's a fab selection of educational toys and 10% off your first order. I'm going to be heading straight over there soon with my 20% #kidsstickerswap first order discount which will also be provided to all swappers!